Well the month overall has been mild. Temperatures through yesterday were running 4° above average…but at least for the last couple of days of the year, it appears that we’ll be well below average as we finish off 2014. Rest of today: Mostly cloudy and cold with struggling temperatures. Highs should struggle in the teens today. North winds will continue to contribute to near 0° wind chill factors. Tonight: Fair and bitterly cold with lows between 0-5°. It’s tough for KC to drop below 0° when there is no snow on the ground. It’s certainly not out of the question though as the map in the discussion section shows how close the sub-zero temperatures are this morning. Tomorrow: Fair skies and cold again with highs near 20°. A strong but temporary push of arctic air has settled into the region today. Temperatures early this morning are sub-zero just towards the north of the KC area as the following map shows. In the map below the temperatures are in RED…click on it to make the 7AM temperatures more readable. This is coming about because of a very strong arctic high that is building through the Rockies this morning and building down through the Plains states. This has pushed a large area of cold weather through the region. 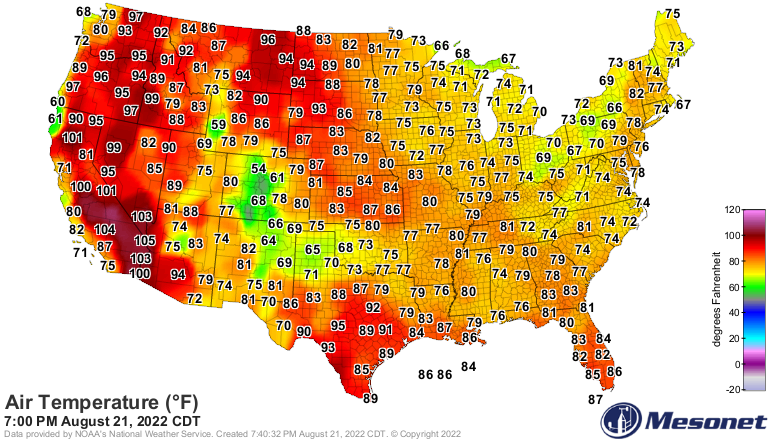 -10 to -15° temperatures in the N Plains is really not that big of a deal in my opinion. An airmass like this during late DEC really should be sending temperatures to 30 below up there (if not colder). 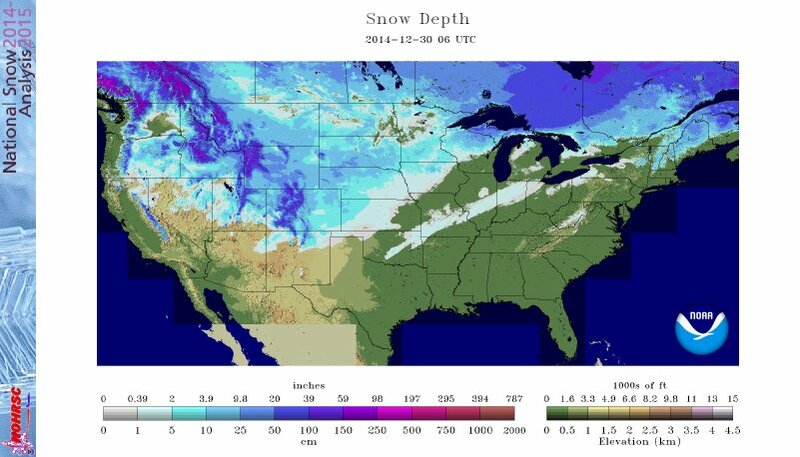 One reason why is the snowcover situation which isn’t as expansive as we’ve seen in previous years in late December…especially up there. Remember take away that 1st shade and usually at least part of the 2nd shade as well…since this map overdoes things. The push of the cold air has moved into the western part of the country…and it’s here that the weather will be the most interesting for the next couple of days as an unseasonably cold storm drops through the western part of the country and creates some unique though not unheard of weather for some of the western cities including Las Vegas where a rare Winter Weather Advisory is in effect for the LV strip area. Although accumulating snow may be tough to come by. What makes this storm unique is that the snow levels will be rather low in the elevations out there. In Southern CA the snow elevation may come down to about 1500-2000′ or so. So what about that storm? How will it effect us? Good questions with still no great answers although the future of the storm may start coming into better focus over the next 24 hours. What we’re fighting at this point is 1) the direction/track the storm takes when it comes out of the SW part of the country…2) when that exactly happens…3) how strong will it be by then…4) how much cold air, if any, will still be around by then (surface and above) and other aspects as well. The model data has had it’s various moments of saying snowstorm, some rain>snow, and little to nothing. Right now I lean more towards the rain>snow chances than nothing at all. Should that aspect play out we should at least get something to accumulate. For snow lovers though beggars can’t be choosey. The path and strength of the storm will help or hurt the cause the most and that’s what I’ll be working on later today for the evening newscasts. Temperatures will be moderating later in the week somewhat…at least to 32° (if not above) and behind the storm we should turn cold again on Sunday. How long it stays cold after that is subject to much debate and we’ll get into that more later in the week. Our feature photo of the day is from Todd who took it in FL yesterday in Miromar Lakes…not all of the country is nasty cold this morning! By the way…one of the reasons why I forecasted such a cold extreme temperature on my winter forecast (lowest being -14°) was because of set-ups like tomorrow morning. With snowcover on the ground…we’d be 7-15° below zero. That won’t be the case though.